This is a follow-on to yesterday’s posting. Listening to yesterday’s game against the Marlins, when Drew Storen was announced as he was coming in to CLOSE the game in the bottom of the 9th, I was not at all surprised after what happened Monday night (see my posting of yesterday:). And Storen did help seal the win! No, it was not pretty, but let’s admit the Marlins are a very tough team to beat this year. And Storen was throwing excellent stuff at them; his slider, when he gets it where he wants it, is deadly. Trade deadline issues: I expect at least one Nats trade today. Rizzo’s top priority is a lefty reliever. But a strong “bench-player” who can handle 2B and hit better than Danny or Frandsen might tickle his fancy:) Lombo is one guy who can and is a fan favorite around the DC area (he’s a local boy!). Darwin Barney was another until he was just traded by the Cubs a few hours ago. Chase Utley has a no-trade clause and wants to stay in Philly, but DAMN (!) he’d look great in a Nats uniform!! GM Mike Rizzo has been on the phone looking for a new lefty for the bull-pen, and there are several out there available. I would think that means Blevin’s days are numbered, but I’m not hearing anything definite on that. Other than that it looks like the Nats will stick with who they have, coming up on the July 31 trade deadline. No surprise there. The Nats are in pretty good shape for the stretch run, and have won a lot of series in July. The 2 losses to the Marlins in the past two days were especially ugly, however. It was a shame to waste two excellent starts by Strass and Zimmermann. The injury to Ryan Zimmerman is really hurting the offensive production. Zimm is a very good clutch-hitter. Looking at the good news, both Spann and Werth are prime contenders for “Player of the Month.” They have been hitting the cover off the ball in July. Spann even had 2 consecutive 4-hit games! We all know Harper has been struggling with the bat, but he looked more comfortable last night (July 29) and had two key hits. My prime concern is the apparent lack of a team “killer instinct.” Monday night they had the Marlins 6-0 going into the 7th, but they let the game slip away. Teams that really want to get to the World Series DON’T DO THAT! Two of the veterans made key late-inning mistakes; Werth trying to take an extra base on Stanton’s outstanding arm, and McLouth going all-out for a low line-drive that he let skip past him for a triple. My other comment coming from that game is about Matt Williams. He, more than anyone else, was responsible for the Nats’ loss. Soriano was tired from having pitched the night before as well as other recent games. Storen however looked REALLY GREAT that night; I would have had him close out the game. Also, I would have replaced Blevins after he struck out lefty Yellich. The next batter, Jeff Baker, hits lefties very well so the situation called for Williams to bring in a righty such as Aaron Barrett for example. Unfortunately Tyler Clippard was not available for this game. they improve with the bat. They currently rank 20th in MLB in batting average and 17th in runs scored. In all other major parts of the game they are ranked higher than that. 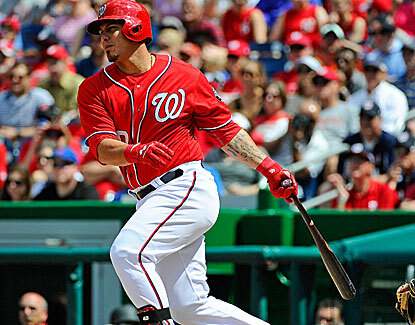 One of the current bright spots (in team hitting) is Wilson Ramos, who now has a 14-game hitting streak going. But the team has been dismal recently in “situational hitting.” Opposing pitchers have been exploiting some team “habits”, such as the tendency of several of the right-handed guys, such as Werth, Zimmerman, Rendon, Desmond and also Ramos who like to hit to the opposite side of the diamond. I’ve watched several pitchers (like AJ Burnett last night) tempt them with a pitch just off the outside corner of the plate and then a succession of offerings that move even further off the plate. Last night I even laughed as Werth flailed at one of Burnett’s pitchers where he would have needed a 40-inch bat to reach! Is It a Ball or Strike? They would rather not talk about it, but umpires may be just as star-struck as the average baseball fan. Two researchers looked at the photographic evidence and found that umpires make more errors in favor of All-Star pitchers than pitchers who have never been selected for an All-Star Game — about 17 percent more. This is a subject umpires are naturally hesitant to discuss. “I don’t know the science,” the umpire Fieldin Culbreth said, sipping a bowl of soup as he prepared for a game between the Mets and the Oakland Athletics. “And I wouldn’t understand it even if you tried to explain it to me. I umpire from here and here,” he said, indicating his head and his heart. But the science exists, for anyone who wants to look at it. Every major league stadium is equipped with the Pitch f/x system, which includes strategically placed cameras that record the locations and trajectories of every pitch. The technology provides a record that is difficult to dispute. In the seasons the study covered, 2008 and 2009, umpires earned a B-plus average, at best, in calling balls and strikes. The researchers — two business school professors, Jerry W. Kim of Columbia Business School and Brayden G. King of Northwestern’s Kellogg School of Management — looked at data on 756,848 pitches over 313,774 at-bats in 4,914 games. Some umpires were, unsurprisingly, more accurate than others, but on average they called a strike on 18.8 percent of pitches that were actually out of the strike zone and a ball on 12.9 percent of pitches that were, in fact, strikes. Many factors besides All-Star status could affect an umpire’s judgment, so the researchers adjusted for the home team advantage, the importance of the at-bat to the outcome of the game, the count at the time of the pitch, whether the pitcher or the hitter was a lefty or a righty, the catcher’s ability to frame a pitch and make a ball look like a strike, and even the size of the crowd. But after controlling for all these variables and more, the advantage gained by a pitcher’s status was still large. For each additional appearance in an All-Star Game there was a 4.8 percent increase in the probability that an actual ball would be called a strike. A player with five All-Star appearances had a 14.9 percent chance of a true ball being called a strike, which is a 16.7 percent increase over the chance a journeyman will benefit from the same mistake. The error is not just the result of All-Stars being around the plate more than other pitchers. Even on the identical pitch just outside the zone, All-Stars got the call when journeymen did not. With miscalled strikes, the same thing happens in reverse. A pitch in the strike zone thrown by a journeyman has a 19 percent chance of being called a ball. For the All-Star, the probability drops to 17 percent. That may not seem like a lot, but it means that an All-Star gets an automatic 9 percent advantage based not on his performance but on his reputation. Although the effect is somewhat weaker, the same kind of bias appears when an All-Star batter is at the plate. The researchers calculate that a five-time All-Star has roughly a 5 percent or 6 percent advantage in getting a favorable ball-strike call. The suspicion that the stars are treated differently by umpires is widespread among both players and fans, but until now it has been based on anecdote and rumor. That there are numbers to support the belief came as a revelation to some players. The study does not name any names, but Wainwright, the Cardinals’ ace, is the kind of All-Star who would get the called strike that others would not. Kim, the Columbia professor, said others were probably also given an advantage. “I suspect that players like Justin Verlander or even Koji Uehara would benefit quite a lot,” he said, naming Detroit’s ace and Boston’s closer. 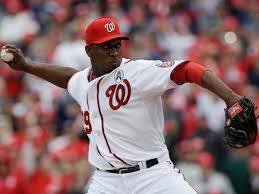 Rafael Soriano, since coming to the Nats, has saved 89% of his “save chances.” That happens to be the lifetime average for Mariano Rivera, the greatest closer ever! Tom Boswell’s article in today’s Washington Post makes a strong case that Soriano ought to be on the all-star team this year. His other numbers are VERY good, but personally I wouldn’t fall on my sword over getting him on the AS team. Oakland’s Billy Decides (finally) to Win NOW! Taken as a whole, the 12 Nats pitchers are simply the best team of pitchers in baseball thus far. That said, they have no “super-stars” who would be automatic picks for the All-Star game. Three starters (Fister, Roark and J-Zimm) have ERAs below 3.00; that puts them in the top 10 or so starters in the National League. Closer Soriano is a possibility too, as are late-inning setup guys like Storen and Clippard. Setup guys rarely make the AS game, but Clippard himself did in 2011! This is a follow-up to yesterday’s post on Adam Laroche. He and Anthony Rendon are definitely in the All-Star conversation; that’s not just a personal opinion but is based on all the chatter I am listening to on radio, TV and internet. But I did vote for them and Ian Desmond also. FYI: As most of us know, All-Star Team Mgr Mike Matheny will have lots of ability to add players to those who fans have voted onto the team. Paul Goldschmidt is going to start the All-Star game at 1B. That’s a given. But Laroche, Morneau and Freeman are the backup first basemen that are in the conversation. Mike Adams would have also been under consideration, but he is injured at this time. Rendon is in the conversation at both 2B and 3B, but the competition is fierce. Matheny could pick his own third-baseman Matt Carpenter.